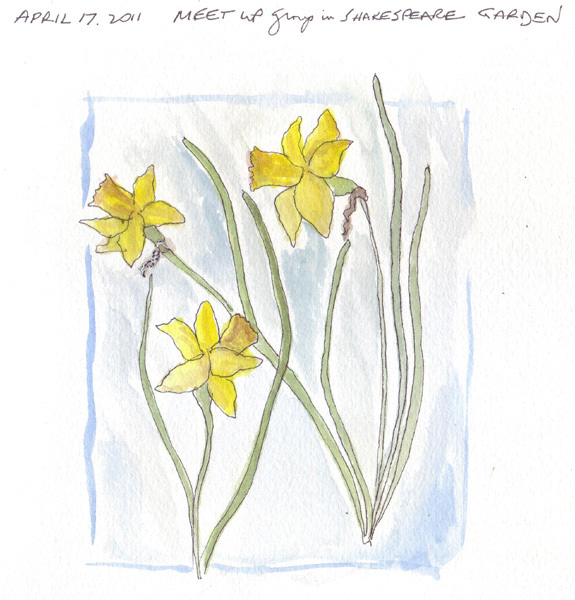 The Sketchbook Challenge for April is "branching out" and I definitely added another way of sketching in my watercolor journal during this time. 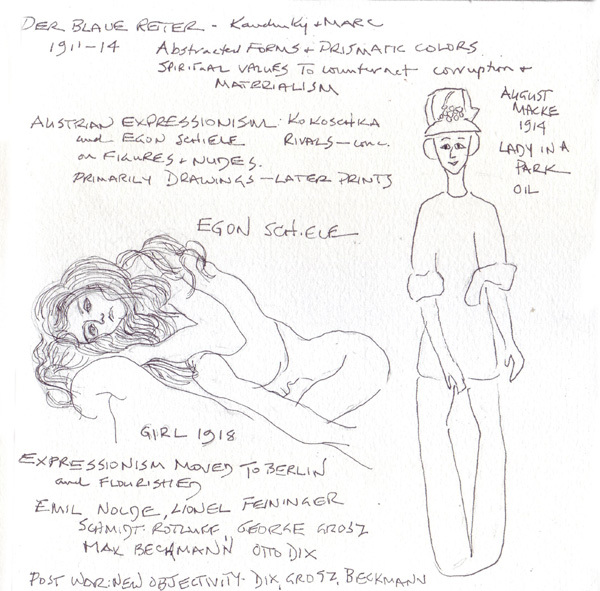 I went back to the German Expressionism exhibit at MoMA on Monday, and took notes and made some drawings from the Bridge and Blue Rider artists - while listening to a Gallery Conversation by a MoMA employee. I usually don't take notes and make small drawings in my watercolor sketchbook, but wanted to remember some of the images from the woodcuts and other prints he was discussing. I love going to figure drawing - and could go twice a week to Society of Illustrators. But I still only go once/month, just trying to keep some balance in my life. These are the three 20 minute poses - all drawn with a watercolor pencil and then wet with water to shade the figures during the last few minutes. Ultimately I would love to draw with a brush and paint, and I'm hoping that this will be good practice for that next step. I was thrilled that I could draw the back of the model for two poses out of the three, because I'm always disappointed after adding facial features. I don't consider myself a plein air painter because I really don't like to paint landscapes. 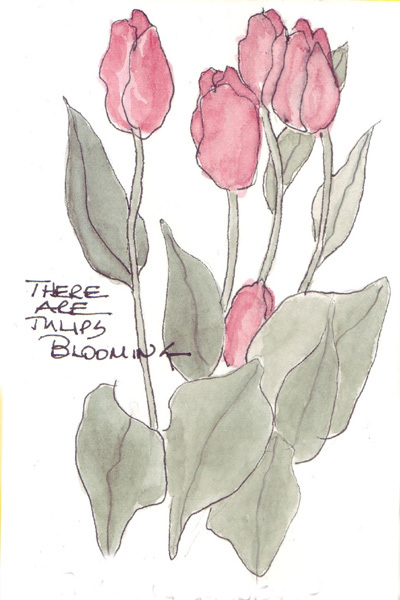 My sketching around the city, to me, is urban sketching - and these are two very different things in my mind. So when Lillian Kennedy (the Boulder Colorado artist who I featured in the last blog post) invited me to sketch in Central Park, I was a little nervous. 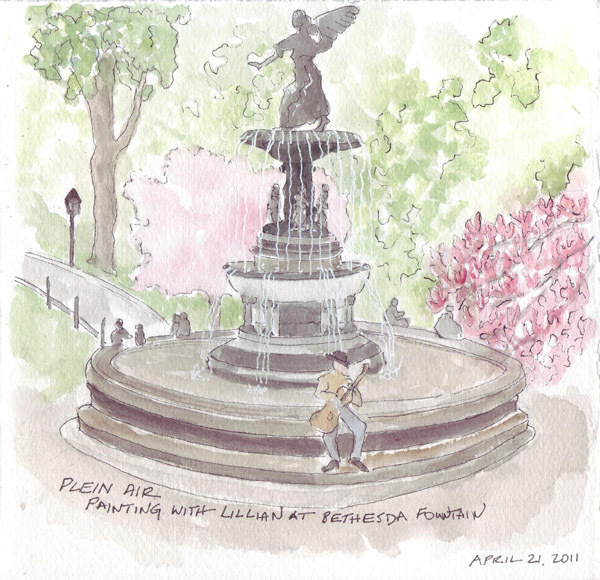 But when she called to tell me she was at Bethesda Fountain, I decided I could draw and paint that - and already have several times. Still, we were sitting back on the hill and I had to include more landscape than I am comfortable with. But it was good for me! And we were serenaded while being blown around a bit by the wind - necessitating a walk to Pain Quotidien for hot coffee - which is actually in Central Park. Lillian had to teach me that! 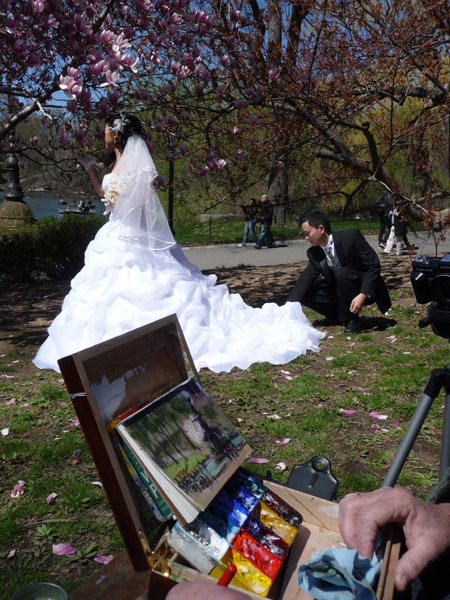 We also were in a spot that is a favorite for wedding photos and here you can see Lillian's painting, her acrylic paint set-up, and the groom adjusting the bride's dress for the photographer. 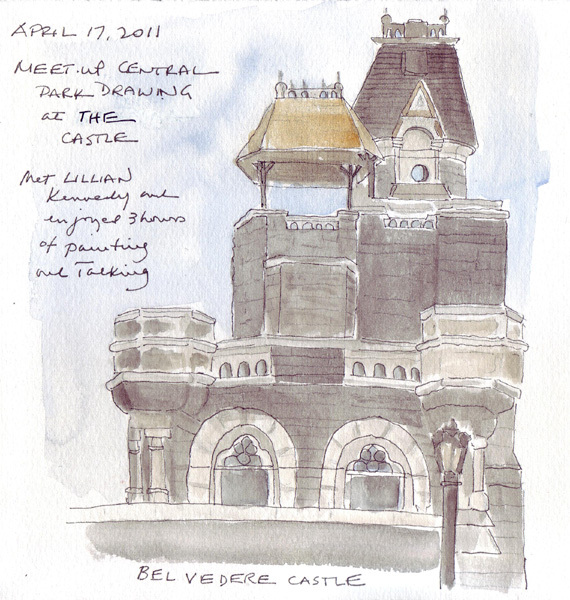 Our Central Park Drawing Meet-up Group met at Belvedere Castle, in the sun, on Sunday and I spent several delightful hours talking to and painting with Lillian Kennedy - a Boulder, Colorado artist. One of her students put us in touch with each other and I was able to meet her before she began teaching students her New York City class. 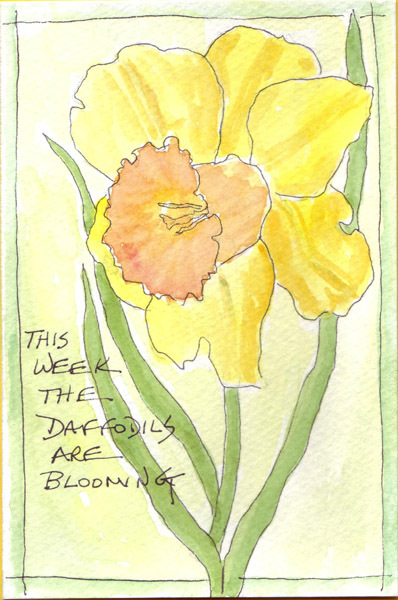 She has a lovely blog and posts one video lesson per week, Here is my Castle painting and a quick one of mini-daffodils that were blooming in the Shakespeare Garden below the Castle. 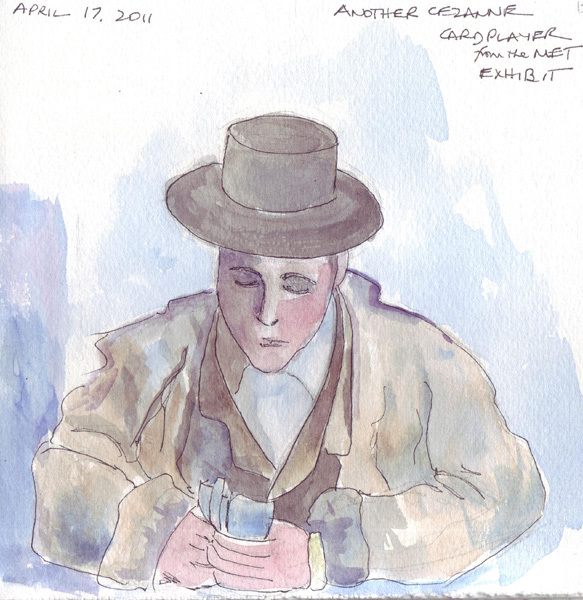 Lillian and I went into the Met to see the Cezanne Card Player exhibit after the Meet-up Drawing session ended and I sketched, and then painted another card player for my collection. This study by Cezanne is an oil painting - and I used watercolors instead. Since painting is not permitted in the museum (or photography in this exhibit), I used a photo from the exhibit catalogue to do the painting at home.